TERRAIN_MAX_AUTOGEN_TREES_PER_CELL. How does this tweak work? how to increase the number of trees. In theory TERRAIN_MAX_AUTOGEN_TREES_PER_CELL should limit the number of trees in every square cell that the FSX world is divided into. Each cell is about 1,2km in width and length. Setting a limit should cap the number of trees defined in scenery autogen files. But it does not affect every scenery. As far as I know – autogen can be placed using several different techniques and this tweak will only work for some of them. FSX limits the number of autogen objects per cell using two parameters. The first is set by slider in your settings or AUTOGEN_DENSITY=5 (value in range from 0 to 5) in your fsx.cfg. The second is TERRAIN_MAX_AUTOGEN_TREES_PER_CELL parameter that defaults to 4500. If it is absent from your fsx.cfg – the default value is set. When drawing autogen the FSX combines this two values to get tree limit. Back to my tests – this is the moment when things get tricky! There are two explanations how autogen is working and both are partly wrong. The first theory is that FSX combines these two values (AUTOGEN_DENSITY * TERRAIN_MAX_AUTOGEN_TREES_PER_CELL) to give you your tree number limit (cap). The second is – that both this values set the limit and FSX takes the lower. It is more complicated. My test showed that setting high value of TERRAIN_MAX_AUTOGEN_TREES_PER_CELL (5000 or 6000) will increase the number of trees you see at every AUTOGEN_DENSITY setting*. Setting the lower limit (like 1500, 750, 250) will decrease the number of trees but with moderate settings (like 1000-2000) the results will be easily visible only in high AUTOGEN_DENSITY settings (like 4 and 5)*. Very small TERRAIN_MAX_AUTOGEN_TREES_PER_CELL (50, 100, 200) settings will be visible with all AUTOGEN_DENSITY settings*. *… oh yes – there is a star, and a fine print. The difference will be visible only in some places. And remember that this tweak may not work at all with certain sceneries (for example ORBX sceneries I tested). Ok – so how to use it? Look at the forests! 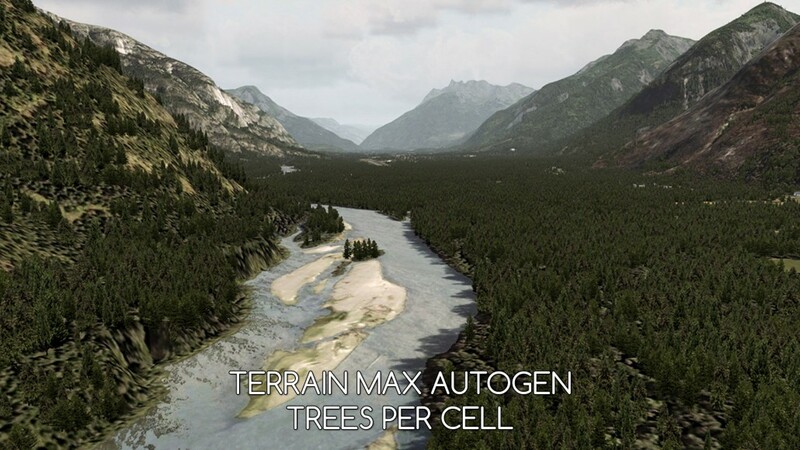 If you look at a place where trees grow sparsely – you may see no difference between TERRAIN_MAX_AUTOGEN_TREES_PER_CELL=100 and TERRAIN_MAX_AUTOGEN_TREES_PER_CELL=6000. When you look at a forest – the difference will be obvious (once again – if your scenery allows this tweak to work). When testing this tweak make sure that you test the same place with different settings. The density of forest is a resultant of the number of trees per area AND the size of this trees. 150 small tress per square kilometer will look sparse. 100 large trees will give impression of density as you fly over. That is why some sceneries look better and some look worse with the same settings and the same number of trees. I you must… Set TERRAIN_MAX_AUTOGEN_TREES_PER_CELL below 4500. I suggest you go below 2000 – the difference between 3000 and 4500 is in most cases negligible. When to limit tree number? Use this tweak only if you experience performance issues while flying over a scenery that has large number of trees and sparse buildings. If your scenery has lots of buildings too – limit AUTOGEN_DENSITY. Once you limit the number of trees – test if your FSX performance improved. If there is no change – the problem lies elsewhere. If the trees alone worsen cause issues with your FSX is rare. It’s a scenery bug in fact (it happened to me in my test scenery for example – just to check the situation in which this tweak would actually be necessary). If you experience autogen problems – you should lower your autogen density in FSX settings or your fsx.cfg AUTOGEN_DENSITY value. This should be enough. If your sure that something is wrong with scenery trees – try this tweak. That is actually a good idea. You may slightly increase the number of trees and the density of forests using TERRAIN_MAX_AUTOGEN_TREES_PER_CELL=6000. It works best with AUTOGEN_DENSITY at 4 or 5 (Very dense, Extremely dense). Recommendation – do it if you use very dense autogen! If you have no problems running FSX with autogen at very dense – use this tweak. You will get some improvement in most sceneries (apart from this which ignore the tweak). If you experience problems with Extremely dense autogen – it will improve forest quality at AUTOGEN_DENSITY=4 (Very dense setting). I use this over VFR Germany photoscenery – it’s autogen causes problems at Extremely dense but works fine at very dense setting with TERRAIN_MAX_AUTOGEN_TREES_PER_CELL=6000. What to do if autogen is causing trouble? AUTOGEN_DENSITY corresponds to autogen slider in FSX menu. Set it between 1 and 5. I recommend 4 on high end PCs and 3 on low end PCs. 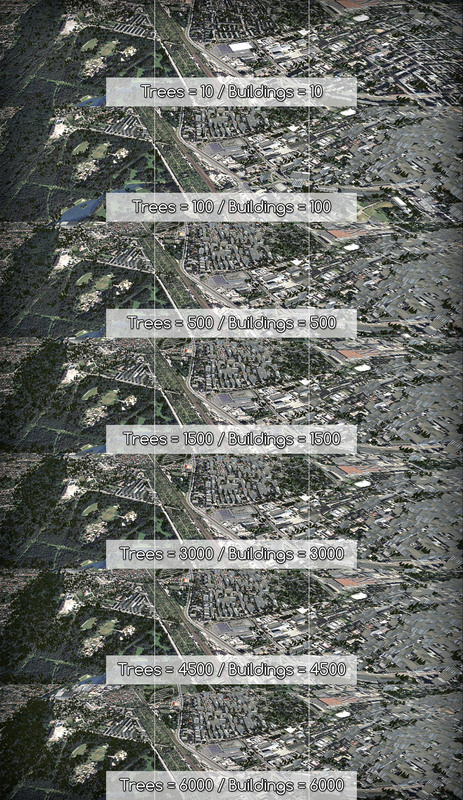 In rare cases of performance problems over large cities with high numbers of building you can limit their number without limiting tree density. For explanation please check TERRAIN MAX AUTOGEN BUILDINGS PER CELL article. There are some sceneries that use autogen placed in the way that it is not affected by TERRAIN_MAX_AUTOGEN_TREES_PER_CELL. During my test I found out that ORBX sceneries that I tested were not affected at all – there was no difference between the number of trees when this tweak was set to 10 or 6000. Some sceneries are showing only a slight difference.